Publications - Website of charles-ehler! Spatial Planning: A Step-by-Step Approach toward Ecosystem-based Management, remains the definitive manual on MSP implementation." 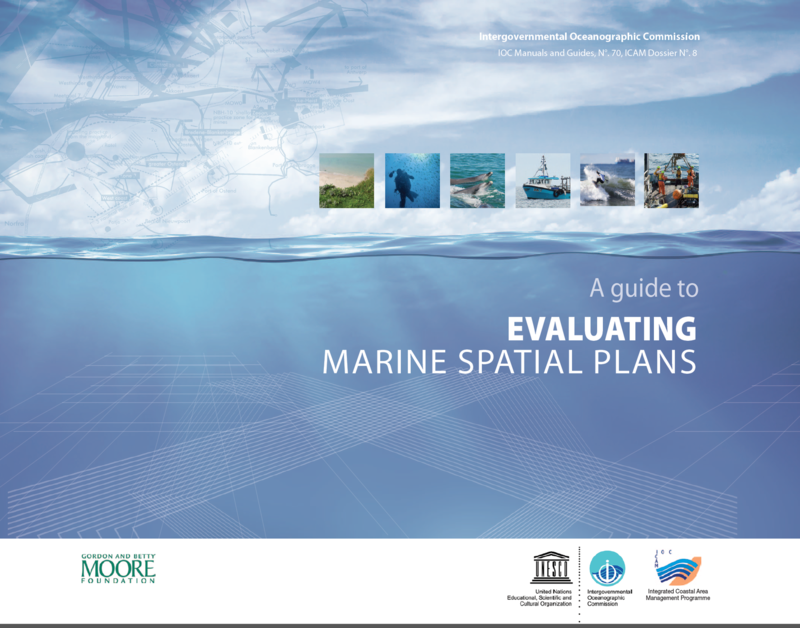 "The UNESCO guide to marine spatial planning is the world's best source on how to do MSP." "We have adopted [the definition of marine spatial planning] from UNESCO that has particular appeal for us by virtue of its intuitive simplicity." "As the marine planning system has developed, the Government has been keen to learn lessons from marine planning implementation across the world....One particularly useful source is UNESCO's"Marine Spatial Planning: A Step-by-Step Approach." Collie, J.S., et al. Marine spatial planning in practice. "The core team of the [MSP Med-Greece] project considered that the UNESCO publication (Ehler and Douvere 2009) offers very useful guidance, to both more and less advanced countries in the field, for the preparation and implementation of their respective policies." 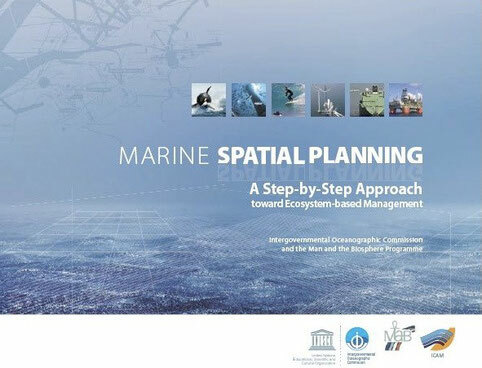 "The Panel has used the UNESCO - Marine Spatial Planning – A Step-by-Step Approach the guide for good practice in MSP..."
"Useful to any team contemplating a MSP initiative will be Ehler and Douvere's step-by-step guide to the MSP process and Ehler's manual on evaluating marine spatial plans." "Literally everywhere I go in the world [to talk about marine planning], people know about the UNESCO step-by-step guide to marine spatial planning. In 2016, the UNESCO guide hits its 10-year anniversary and I think it’s safe to say that no other guide or publication for marine spatial planning has had the reach, influence or inspiration as this one has over the past decade. I have used this guide for our on-the-ground work in Canada, Seychelles, and Indonesia, and used it to support marine spatial planning discussions in Mexico, Caribbean nations, Australia, South Africa, New Zealand, and Mauritius. As a guidance document, it is an invaluable resource [for governments, consultants, NGOs and scientists] to grasp the basic concepts and then employ the detailed approach necessary for MSP and launch a process." Catarina F. Santos, et al. Ehler, Charles N., guest editor, 2019. Special Issue on Marine Spatial Planning. Marine Policy. Manuscripts in prooduction. Santos, C.F., C. Ehler, T. Agardy, F. Andrade, M.K. Orbach, and L.B. Crowder, 2018, Major challenges in developing marine spatial planning. Marine Policy. Accepted for publication in special issue on MSP. Ehler, Charles N., Zaucha, Jacek, and Gee, Kira, 2018. Chapter 1: Marine Spatial Planning at the Interface of Practice and Research. In Maritime Spatial Planning: past, present, future. (Jacek Zaucha and Kira Gee, eds.). London, UK: Palgrave Macmillan. Santos, C.F., C. Ehler, T. Agardy, F. Andrade, M.K. Orbach, and L.B. Crowder, 2018, Chapter 30 on Marine Spatial Planning in: (C. Sheppard, ed.) World Seas: an Environmental Evaluation, Vol. III: Ecological Issues and Environmental Impacts, second edition. Oxford, UK: Pergamon Press. pp. 571-592. Ehler, Charles N., 2018. Chapter 22 on my career in: Marine Conservation: People, Ideas, and Action. (Bob Earll, ed.). Exeter, UK: Pelagic Publishing. pp. 237-249. Ehler, Charles N., 2018. Chapter 1, Marine spatial planning, in: Ocean Energy and Marine Spatial Planning. (Yates, K., Bradshaw, C., eds). Oxford, UK: Routledge. pp. 6-17. Ehler, Charles N., ed., 2018. Final Report of the 2nd International Conference on Marine/Maritime Spatial Planning. IOC-UNESCO and European Commission-DGMare, 15-17 March 2017, Paris, France. IOC Workshop Reports Series No. 279. 54 p.
Pinarbasi, Kemal, Ibon Galparsoro, Angel Borja, Vanessa Stelzenmuller, Charles N. Ehler, and Antje Simpel. Decision support tools in marine spatial planning: present applications, gaps, and future perspectives. Marine Policy, 83: 83-91. Santos, Catarina Frazao, Tundi Agardy, Francisco Andrade, Manual Barange, Larry B. Crowder, Charles N. Ehler, Michael K. Orbach, and Rui Rosa, 2016. Ocean planning in a changing climate. Nature Geoscience. Vol. 9. October. p. 730. On-line version of paper at: http://www.nature.com/ngeo/journal/v9/n10/full/ngeo2821.html. Ehler, Charles N., 2016. Establish financing for all of the essential elements of marine management. Marine Ecosystems and Assessment Newletter. Posted 11 July 2016. Ehler, Charles N., 2016. "You're either at the table or you're on the table. The importance of participating in MSP processes". Marine Ecosystems and Assessment Newsletter. Posted 4 April 2016. Ehler, Charles N., and Fanny Douvere, 2015. Marine spatial planning: delivering ecosystem-based management. In: The Protected Areas Governance and Management Book (Worboys, G.L, M. Lockwood, and A. Kothari, eds.) IUCN: Gland, Switzerland. Ehler, Charles, 2014. A Guide to Evaluating Marine Spatial Plans. UNESCO, Intergovernmental Oceanographic Commission: Paris, France. IOC Manuals and Guides No. 70., ICAM Dossier 8. 96 p. http://unesdoc.unesco.org/images/0022/002277/227779e.pdf. Translated and published in Chinese by China Ocean Press in 2018. Ehler, Charles N., 2014. Viewpoint from a practitioner: Back to the future: integrating past, present, and future. Chapter 10, "Incorporating Historical Perspectives in Systematic Marine Conservation Planning" in: Marine Historical Ecology in Conservation: Applying the Past to Manage for the Future (eds., Kittinger, McClenachan, Gedan, & Blight). University of California Press: Berkeley, CA, USA. Ehler, Charles N., 2013. Marine spatial planning—what have we learned from international experience. In: Nguyen Chu Hoi, et al. National Workshop Proceedings on Application of Viet Nam’s Marine and Coastal Spatial Planning—an ecosystem-based management approach. Gland, Switzerland: IUCN, 89 p.
Ehler, Charles N., 2012. A Global Review of Marine Spatial Planning. Internal report prepared for the World Wildlife Fund (WWF) United Kingdom, Germany, Canada, and Mediterranean. September. 123 p.
Ehler, Charles N., 2012. 13 Myths of Marine Spatial Planning. Marine Ecosystems and Management Newsletter. Vol. 5, no. 5. April-May. pp. 5-7. Ehler, Charles N., 2011. Marine spatial planning in the Arctic. Marine Ecosystems and Management. Vol. 4, no. 5. April-May. pp. 7-8. Ehler, Charles N., 2011. Balancing the change implied by adpative management with the certainty promised by marine spatial planning. Marine Ecosystems and Management. Vol. 4, no. 3. December 2010-January 2011. pp. 3-4. Ehler, Charles N., and Fanny Douvere, 2010. An International perspective on marine spatial planning initiatives. Environments. Vol. 37(3), pp. 9-20. Ehler, Charles N. Does marine spatial planning have to be ecosystem-based?, 2010. Marine Ecosystems and Management. Vol. 3, no. 4. February-March. p. 2. Ehler, Charles N., and Fanny Douvere, 2010. 2009 Baltic Sea Scorecard: Measuring Progress toward Integrated Sea Use Management in the Baltic Sea. WWF Baltic Sea Programme: Solna, Sweden. 26 p.
Douvere, Fanny, and Charles N. Ehler, 2009. Ecosystem-based marine spatial management: a new paradigm for the management of coastal and marine places. Ocean Yearbook 23. April. pp. 1-7. Douvere, Fanny, and Charles N. Ehler, 2009. Marine spatial planning: a promising new paradigm for applying an integrated, ecosystem approach to ocean management. Proceedings of the ICES 2008 Annual Science Conference, Halifax, Nova Scotia. ICES. Paper E-24 in Theme Session E: Marine Spatial Planning. Douvere, Fanny, and Charles N. Ehler, issue eds., 2008. Special Issue on Ecosystem-based, Marine Spatial Management. Marine Policy. 32 (August). Douvere, Fanny, and Charles N. Ehler, 2008. Introduction. Special Issue on Ecosystem-based, Marine Spatial Management (Douvere & Ehler, eds). Marine Policy. 32: 759-761. Ehler, Charles N., and Fanny Douvere, 2007. Visions for a Sea Change. 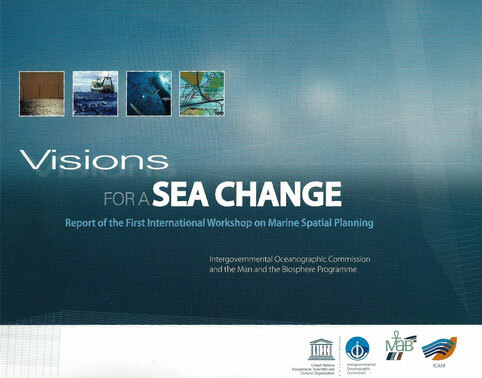 Technical Report of the International Workshop on Marine Spatial Planning, 8-10 November 2006. ICAM Dossier Series, Intergovernmental Oceanographic Commission: UNESCO: Paris, France. IOC Manual & Guides No. 46, ICAM Dossier 3. 84 p.
Douvere, Fanny, and Charles N. Ehler, 2007. A summary of the International Workshop on Marine Spatial Planning, 8-10 November 2006. Marine Policy. Vol. 31. July. pp. 582-583. "The starting point for the spread of MSP internationally..... The UNESCO/IOC workshop was important for connecting scientists to practitioners and planners to marine conservationists who operated at the local and regional scales and then became involved in moving MSP forward internationally. More importantly this focussed activity at the international level helped to coordinate the parallel, disparate processes that were occurring at the time. This initiative acted as a catalyst to bring together the different strings of marine planning and bundle them together to create a globally coherent MSP process with particular constituent elements. " Ehler, Charles N. (editor). 2005. Integrated MPA management with coastal and ocean governance: principles and practices. Special issue of Ocean and Coastal Management Journal. Vol. 48. Ehler, Charles N., Nguyen Chu Hoi, and Nguyen Le Hoa. 2005. Final Evaluation: Hon Mun Marine Protected Area Project, Khnah Hoa Province, Vietnam. IUCN-Vietnam and The World Bank. 36 p.
Cicin-Sain, Biliana, Charles N. Ehler, & Stefano Belfiore (eds.). 2004. Incorporating Marine Protected Areas into Coastal and Ocean Management: Principles and Guidelines. International Union for the Conservation of Nature: Gland, Switzerland, and Cambridge, UK. viii + 38 pp. Ehler, Charles N., & Arthur Paterson. 2004. Building a global MPA network, one park at a time. World Conservation, The IUCN Bulletin, No. 1. pp. 16-17. Ehler, Charles N., & Simon Cripps. 2004. Foreword. How Is Your MPA Doing? A Guidebook of Natural and Social Indicators for Evaluating Marine Protected Area Management Effectiveness (Robert S. Pomeroy et al). IUCN: Gland, Switzerland, and Cambridge, UK. Ehler, Charles N. (Interview). 2004. Measuring MPA effectiveness: new guide provides framework and cases. MPA News, Vol. 5, No. 10. p. 6. Ehler, Charles N. 2004. A perspective on the biodiversity conference. MPA News, Vol. 5, No. 9, April. p. 4. Ehler, Charles N., 2003. Cross-cutting themes of the World Parks Congress: marine; and the workshops: what did we learn: the marine gap? World Conservation, The IUCN Bulletin, No. 2. pp. 22-27. Ehler, Charles N., 2003 Indicators to measure governance performance in integrated coastal management. Ocean and Coastal Management Journal, Vol.46, Issues 3-4, pp. 335-345. Ehler, Charles N., 2003. Measuring the success of integrated coastal management programs. In: Proceedings of the Third Joint Meeting, Coastal Environmental Science and Technology Panel of the US-Japan Cooperative Program in Natural Resources (UJNR). Yokosuka, Kanagawa, Japan. Ehler, Charles N. (interview). 2002/03. Managing the oceans. Marine Scientist. No. 2, Winter, p. 20. Cicin-Sain, Biliana, & Charles N. Ehler. 2003. Sustainable tourism and coastal management in the Adriatic. The Adriatic Sea: A Sea At-Risk, A Unity of Purpose (Neal Ascherson & Andrew Marshall, eds.). Religion, Science and the Environment: Athens, Greece. pp. 57-64. Cicin-Sain, Biliana, and Charles N. Ehler, eds. 2002. Proceedings of Workshop on Improving Regional Ocean Governance in the United States. University of Delaware: Newark, DE. December. 212 p.
Ehler, Charles N., & Edgardo Gomez. 2000. Foreword. Socioeconomic Manual for Coral Reef Management (Bunce, Leah, et al). Australian Institute of Marine Science: Townsville, Australia. Ehler, Charles N. 2000. Opening remarks. In Proceedings of the Second Joint Meeting (Dooso Jang, ed.). Coastal Environmental Science and Technology Panel of the US-Japan Cooperative Program in Natural Resources (UJNR), National Oceanic and Atmospheric Administration: Silver Spring, MD. February. pp. 29-32. Ehler, Charles N. 1999. Introduction. Proceedings of the International Conference on Marine Disasters: Forecast and Prediction (Yu Zhouwen, ed.). China Ocean Press: Beijing, China. pp. 3-4. Ehler, Charles N. 1998. Foreword, Introductions to Chapters 4, Degradation and Conflict, and Chapter 7, Industrial Impact. In The Black Sea in Crisis (Sarah Hobson and Laurence D. Mee, eds.). World Scientific Publishing Co: Singapore. pp. ix-xi, 93-95, and 185-186. Ehler, Charles N. 1998. The Global Programme of Action for the Protection of the Marine Environment from Land-based Activities. Ocean & Coastal Policy Network News. Vol. 1, no. 1. September . p. 9. Ehler, Charles N. (lead author). 1998. Perspectives on marine environmental quality today. Year of the Ocean Report. National Oceanic & Atmospheric Administration: Washington, DC. Ehler, Charles N. 1998. Managing for sustainability in the coastal environment (Foreword) and Integrated coastal management in the USA — lessons for the future (Chapter). Marine Environmental Management: Review of Events in 1997 and Future Trends. (Bob Earll, ed.) Gloucestershire, United Kingdom. pp. 1-2 and 39-44. Ehler, Charles N.,1998. A new international partnership: the US-Japan Panel on Coastal Environmental Science and Technology. Port and Harbour Journal (in Japanese). Ehler, Charles N., et al. 1997. Guidelines to assist policy makers and managers of coastal areas in the integration of coastal management programs and national climate action plans. Ocean and Coastal Management. Vol. 37, No. 1, pp. 7-27. Cicin-Sain, Biliana, Charles N. Ehler, Robert Knecht, Robin South, and Weiher, 1997. Guidelines for Integrating Coastal Management Programs into National Climate Action Plans. Developed at the International Workshop for Climate Change Through Integrted Coastal Management. 24-28 February 1997. Taipai, Taiwan. 18 p.
Ehler, Charles N. 1997. General introduction to the book and Introduction to Chapter 5, Managing in an Era of Uncertainty. In: Revelation and the Environment, AD 95-1995, the Patmos Symposium (Sarah Hobson and Jane Lubchenco, eds.). World Scientific Publishing Co: Singapore. pp. vii-viii and 101-102. Ehler, Charles N., Hiroaki Ozaza, and Sidney Thurston. 1997. The Coastal Environmental Science and Technology Panel: US-Japan efforts to restore the health of our coasts. Marine Technology Society Journal. Vol. 31., no. 2. Summer. pp. 60-63. Ehler, Charles N., 1996. South Florida: a laboratory for ecosystem restoration and integrated coastal management. Marine Technology Society Journal. Vol. 30, No. 3, Fall. pp. 13-20. L. Bijlsma, C.N. Ehler, R.J.T. Klein, S.M. Kulshrestha, R.F. McLean, N. Mimura, R.J. Nicholls,L.A. Nurse, H. Pérez Nieto, E.Z. Stakhiv, R.K. Turner, and R.A. Warrick, 1995. Coastal Zones and Small Islands. In: Climate Change 1995: Impacts, Adaptations and Mitigation of Climate Change: Scientific-Technical Analyses. Contribution of Working Group II to the Second Assessment Report of the Intergovernmental Panel on Climate Change. Edited by Robert T. Watson, Marufu C. Zinyowera, and Richard H. Moss. Cambridge University Press, Cambridge,UK, 289-324. Ehler, Charles N. and Blair T. Bower. 1995. Toward a common framework for integrated coastal zone management. In: Proceedings of Coastal Zone ‘95, Spotlight on Solutions. Ehler, Charles N. 1995. Coastal ocean space management: challenges for the next decade. In: Coastal Ocean Space Utilization III (Norberto Della Croce et al., eds.). Chapman and Hall: London, UK. pp. 175-187. Ehler, Charles N. 1995. The importance of environmental information in planning and analysis: application to Osaka Bay. In: Proceedings of the Osaka-Wan Symposium (in English and Japanese), Japan Ministry of Transport: Tokyo. pp. 15-18. Bijlsma, Luitzen, Charles N. Ehler, and Nobuo Mimura, 1994. Preparing to Meet the Coastal Challenges of the 21st Century. Conference Report. World Coast Conference 1993. Intergovernmental Panel on Climate Change. Ministry of Transport, Public Works and Water Management, National Institute for Coastal and Marine Management/RIKZ, Coastal Zone Management Centre, The Hague, The Netherlands. Ehler, Charles N. 1994. Toward integrated coastal zone management—recent US experience. In: Proceedings of the 2nd International Conference on Oceanography, Toward Sustainable Use of Oceans and Coastal Zones. November 14-19, Lisbon, Portugal. Ehler, Charles N., and Daniel J. Basta. 1994. Bridging the gaps among science, management, and public policy. Coastal Zone ‘94 Proceedings. Halifax, Nova Scotia. Ehler, Charles N., and Daniel J. Basta. 1993. Integrated management of coastal areas and marine sanctuaries: a new paradigm. Oceanus. Vol. 36, no. 3. Fall. pp. 6-13. Ehler, Charles N. (ed. ), 1993. Preparatory Workshop on Integrated Coastal Zone Management and Responses to Climate Change. Proceedings of the IPCC/WCC’93 Western Hemisphere workshop, New Orleans, 13-16 July 1993, National Oceanic and Atmospheric Administration, Silver Spring, MD. Ehler, Charles N., 1993. Improving the information base for ocean space use planning and management. In: International Perspectives on Coastal Ocean Space (Phyllis M. Grifman and James A. Fawcett, eds.). University of Southern California: Los Angeles, CA. pp. 3-10. Ehler, Charles N., 1993. Monitoring. In: Global Marine Biological Diversity (Elliott A. Norse, ed.). Island Press: Washington, DC. pp. 197-198. Ehler, Charles N., et al., 1992. From boats to bytes—new applications of geographic information to the management of US coastal and marine resources. Commission on Marine Geography of the International Geographical Congress, August 6-9. Washington, DC. 15 p.
Ehler, Charles N., 1991. Summary of remarks on use conflicts and threats: pollution. In: National Forum on Ocean Conservation. The Smithsonian Institution: Washington, DC. pp. 67-68. Ehler, Charles N., 1990. NOAA viewpoints on management and legislative implications of recent oil spills. Marine Technology Society Journal. Vol. 24, no. 4. December. pp. 23-27. Ehler, Charles N., 1990. Management and legislative implications of recent oil spills. Oil Spills (Malcolm L. Spaulding and Mark Reed, eds.). American Society of Civil Engineers: New York, NY. pp. Ehler, Charles N. 1990. Oceans of data—islands of knowledge: information for decisions about the use of coastal ocean space. In: Coastal Ocean Space Utilization (Susan D. Halsey and Robert B. Abel, eds.). Elsevier: New York. pp. 3-7. Ehler, Charles N., et al., 1988. The Bering, Chukchi, and Beaufort Seas Coastal and Ocean Zones Data Atlas, NOAA Ocean Assessments Division: Silver Spring, MD. 127 maps and text. "[NOAA] relied on science-based data to build maps and expert opinion to fill gaps in knowledge. It created a set of thematic maps covering physical processes and pelagic, demersal, and benthic fauna, including invertebrates, fish, birds, and mammals. This excellent, but now outdated, work provided much useful information for the [2010 Audubon Alaska] atlas. In many cases, recent science has advanced beyond the knowledge in existence when this atlas was created; in many other cases, this atlas still captures the best information available." Ehler, Charles, et al. 1986. New oceanic and coastal atlases focus on potential EEZ conflicts. Oceanus. Vol. 29, no. 3. Fall. pp. 42-51. Ehler, Charles N., Daniel J. Basta, et al., 1986. The Gulf of Mexico Coastal and Ocean Zones Data Atlas. US Government Printing Office: Washington, DC. 163 maps and text. "As plans to restore the Gulf of Mexico after recent disasters [Deepwater Horizon oil spill, 2010] have progressed, federal and state agencies have turned to NOAA for data and information about all aspects of the Gulf of Mexico. One of the most requested resources for that data and information has been the "Gulf of Mexico Coastal and Ocean Zones Strategic Assessment Data Atlas" published by NOAA's National Ocean Service in 1985 as a large hardcopy tabletop book." Ehler, Charles N., et al., 1986. A National Atlas of the Health and Use of Coastal Waters. National Oceanic and Atmospheric Administration: Silver Spring, MD. 5 folio maps. Ehler, Charles N., et al., 1985. The National Coastal Pollutant Discharge Inventory. Coastal Zone ‘85, Proceedings of the Fourth Symposium on Coastal and Ocean Management. 1985. pp. 961-977. Ehler, Charles N., and Daniel J. Basta, 1984. Strategic assessment of multiple resource-use conflicts in the US Exclusive Economic Zone. In: Exclusive Economic Zone Papers. Marine Technology Society and Institute of Electrical and Electronic Engineers: Washington, DC. pp. 1-6. Charles N. Ehler. 1984. Foreword to The Use of Economic Analysis in Valuing Natural Resource Damages. National Oceanic and Atmospheric Administration: Rockville, MD. pp. iii-iv. Ehler, Charles N., and Daniel J. Basta, 1983. NOAA’s strategic assessment programme in the Gulf of Mexico. Marine Pollution Bulletin. Vol. 14, no. 9. pp. 325-334. Ehler, Charles N., Daniel J. Basta, and Thomas F. LaPointe, 1983. Analyzing the effects of operational discharges of oil from ships into the Gulf of Mexico. Proceedings of the 1983 International Oil Spill Conference. American Petroleum Institute: Washington, DC. Ehler, Charles N., Daniel J. Basta, and Thomas F. LaPointe. 1983. An automated data system for strategic assessment of living marine resources in the Gulf of Mexico. Proceedings of AUTOCARTO5, Conference on Environmental Assessment and Resource Management. pp. 83-91. Ehler, Charles N., et al., 1983. Identifying and Evaluating Alternative Ocean Dump Sites: an Illustration of an Operational Framework for Strategic Assessment. National Oceanic and Atmospheric Administration: Rockville, MD. 35 p.
Ehler, Charles N., 1983. Foreword to Assessing the Social Costs of Oil Spills: the Amoco Cadiz Case Study, National Oceanic and Atmospheric Administration: Rockville, MD. Bower, Blair T., Charles N. Ehler, and Daniel J. Basta, 1982. Coastal and Ocean Resources Management: A Framework for Analysis. International Federation of Institutes for Advanced Study (IFIAS): Solna, Sweden. 59 p.
Ehler, Charles N., and Daniel J. Basta, 1982. Information for assessing the future use of ocean resources. Marine Pollution Bulletin. Vol. 13, no. 6. pp. 186-191. Ehler, Charles N., 1982. Foreword to Economics of Ocean Resources: A Research Agenda (Brown, Gardner M., and James A. Cruthfield, eds.). University of Washington Press: Seattle, WA. pp. vii-ix. Ehler, Charles N., et al. 1982. Strategic assessment of US coastal and ocean regions: preliminary results of the East Coast project. Coastal Zone ‘80, Proceedings of the Second Symposium on Coastal and Ocean Management (Billy L. Edge, ed.). pp. 2938-2962. Ehler, Charles N., Daniel J. Basta, et al., 1980. Eastern US Coastal and Ocean Zones Data Atlas. National Oceanic and Atmospheric Administration: Rockville, MD. 127 maps and text. Ehler, Charles N., 1977. An overview of EPA’s land use and environmental quality management research program. Proceedings of the Research Symposium on Environmental Quality and Land Use Planning. US Environmental Protection Agency: Washington, DC. pp. 23-25. Spofford, Walter O., & Charles N. Ehler, 1976. Regional residuals-environmental quality management models: applications to EPA’s regional management programs. In: Environmental Modeling and Simulation (Wayne R. Ott, ed.). US Environmental Protection Agency: Washington, DC. 1976. pp. 407-413. Ehler, Charles N., 1975. Management systems for minimizing regional environmental stress: research and applied aspects of planning, implementation, and enforcement. Second Joint US/USSR Symposium on the Comprehensive Analysis of the Environment. US Environmental Protection Agency: Washington, DC. pp. 144-154. Ehler, Charles N., M. Dean High, and Terrence A. LiPuma, 1975. Socio-economic analyses of air quality maintenance strategies: the Baltimore case study. Proceedings of the 68th Annual Meeting of the Air Pollution Control Association. June. Ehler, Charles N., and Roger D. Shull, 1975. Integrated regional environmental quality management: extending the concepts of area-wide waste treatment management. Proceedings of Planning ‘75: Innovation in Action, 58th Annual Conference of the American Institute of Planners. Ehler, Charles N., 1973. Intergovernmental communication in the New York-New Jersey-Connecticut region. Urban Telecommunications Forum. Vol. 2, no. 3, March. pp. 7-8. Ehler, Charles N., 1973. Transportation: problems and prospects. Science Books. Vol. 9, no. 1. May. Ehler, Charles N., 1973. Planning education for real. Bulletin of the Association of Collegiate Schools of Planning. Vol. 11, no. 1. Spring. pp. 5-8. Ehler, Charles N., 1972. The spoils of progress: environmental pollution in the Soviet Union (book review). Science Books. Vol. 8, no. 3. December. p. 202. Ehler, Charles N., 1972. Environmental systems planning and management: a preliminary sorting of the literature. Council of Planning Librarians: Monticello, IL. Exchange Bibliography No. 251. Ehler, Charles N., 1972. Integrative forecasting and planning: an annotated review of the literature. Council of Planning Librarians: Monticello, IL. Exchange Bibliography No. 252. January. 65 p.
Ehler, Charles N., 1971. Urban systems design: toward an ecological re-think. American Behavioral Scientist (Special issue: “The American City of the Future”). Vol. 14, no. 6. July/August. pp. 791-801. Ehler, Charles N., 1970. Toward management of the environment (review article). Progressive Architecture. Vol. 51, no. 11. November 1970. pp. 118-126. Ehler, Charles N., 1970. The future of the future (review article). Progressive Architecture. Vol. 51, no. 1. January 1970. pp. 152-155. Ehler, Charles N., Robert M. Beckley, and Hubert C. White, 1969. Unified Transportation Systems and Future Urban and Regional Development. Final report to the Graham Foundation in the Fine Arts, Chicago. June 1969. 152 p.
Ehler, Charles N., 1968. Urban Mechanisms: A Control Tool for Planning. University of Michigan: Ann Arbor, MI. 96 p. (Masters thesis available from University Microfilms, Inc.). Ehler, Charles N., 1968. Les Mechanismes Urbains. Cahiers du Centre d’Etudes Architecturales: Brussels, Belgium. Cahiers no. 3.2. 48 p.
Ehler, Charles N., 1968. Methode des mechanisms urbains: exemples. L’Architecture d’au Jour d’Hui. Vol. 27, no. 9. September (article on graduate regional planning thesis). Ehler, Charles N., 1967. Town planning research. L’Architecture d’au Jour d’Hui. Vol. 26, no. 10. October (publication of architectural undergraduate thesis).